It’s giveaway time! The Australian Museum are kindly giving away 3 double passes to their special after-hours Halloween event at their Jurassic Lounge, which will include exclusive access to the newest exhibition Spiders: Alive & Deadly. Featuring live music and performance, interactive games, hands-on workshops and pop-up bars, this is a ghoulish 18+ way to celebrate Halloween. Check out flesh eating beetles and taxidermy skins followed by insect tasting with Bug Chef. And to top the night off, let your morbid, sly wit shine through by planning your own funeral. 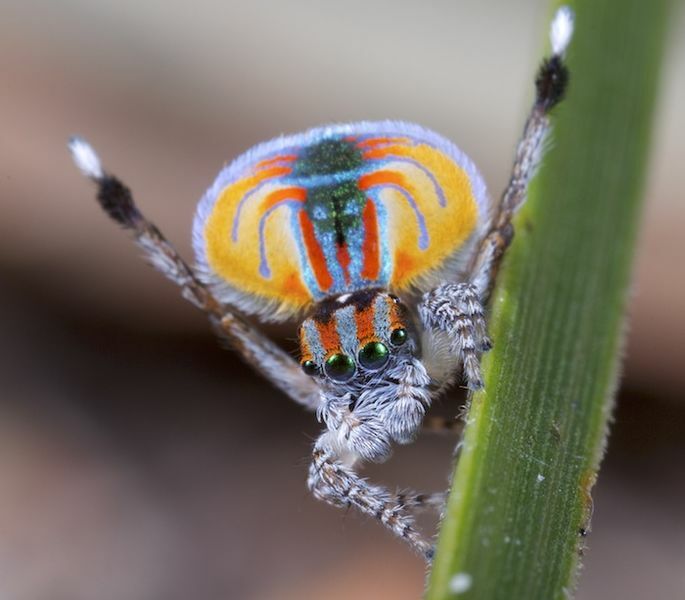 The male Peacock Spider is a beautiful species with really unique vibrant colourings. The colourful abdomen of the spider is used to attract females, much like the peacock – hence the name. And aren’t we lucky, these little guys called Australia home. Simply leave a comment on our Facebook post with your best caption of the above spider image. We’ll select three entries at random to win the tickets. How do I enter? Simply send us your best caption for the peacock spider image in the comments section on Facebook. This competition is only open to people who live in Sydney, Australia and are 18 years or over. When does the competition end? 12:00am AEDT Monday 17 October 2016. How will I know if I won? Winners will be notified via Facebook, and will be asked address details (inside Australia). Please note that any comments that break the house rules of the CSIRO Facebook page will be ineligible. The promoter is the Commonwealth Scientific and Industrial Research Organisation (“CSIRO”) (ABN 41 687 119 230), Clunies Ross Street, Black Mountain, ACT, Australia. Entry to the competition is open to all citizens in Sydney, Australia. Employees, directors and officers of CSIRO or any person associated with the Competition, or any organisation or individual associated with the provision of the prize(s) are not eligible to enter. Each entry must be entered in accordance with these Terms and Conditions. By entering the Competition, each entrant agrees to be bound by these Terms and Conditions. Entries not submitted in accordance with the Terms and Conditions may be deemed ineligible. Information on how to enter and prize details form part of these Terms and Conditions. Entry into the Competition is free. Entrants may submit more than one entry. The Competition period commences at 8:00am AEST on Monday 17 October 2016 and concludes at 12:00am AEST on Tuesday 18 October 2016. Any entry received by the promoter before or after the Competition period may be ineligible for entry and no responsibility will be accepted for lost, late or misdirected submissions. The promoter may at its absolute discretion remove or reject any entry for any reason whatsoever. Each entrant warrants that its entry does not breach the copyright or other intellectual property rights or privacy rights of any other person. The winner will be notified on 18 October via CSIRO’s Facebook account. The prize will be sent to the email address supplied by each winner by registered express post after the announcement of the winner. The prizes are not transferable or exchangeable or redeemable for cash. The promoter is not required to re-award any unclaimed prize. This Competition is in no way sponsored, endorsed or administered by, or associated with, Facebook, Twitter, Instagram or LinkedIn. Any questions, comments, or complaints regarding the promotion should be directed to CSIRO and not to Facebook, Twitter, Instagram or LinkedIn. Each entrant releases Facebook, Twitter, Instagram and LinkedIn from any claim relating to or arising out of the Competition. If the Competition is interfered with in any way or is not capable of being conducted as reasonably anticipated due to any reason beyond the control of the CSIRO, including as a result of technical failures, CSIRO reserves the right, in its sole discretion, to the fullest extent permitted by law to modify, postpone, suspend, terminate or cancel the Competition as appropriate. Except for any liability that cannot by law be excluded including any statutory consumer guarantees, CSIRO, nor any of their respective officers, employees and agents will be liable for any injury, damages, expenses, or loss whatsoever (whether direct or consequential) to persons or property as a result of any person entering the Competition or accepting or using any prize, including without limitation, failure of any winner to contact the promoter, non-receipt of any prize or damage to any prize in transit.